Alright, so the other day I picked up a book from a local library sale. You can see it in the picture above and today I’d like to give you all some insights into it. So if you’re interested in reading it, here is my The Japanese Are Like That Review. The interesting thing about the book is that it was written by Ichiro Kawasaki back in 1955! This makes it really interesting because it talks about “Today’s Japan” from that time period. Obviously some of the things won’t still be the same today in 2018, but there are a few things that have survived the passage of time. Let’s get into it now! So the author of this book was a career diplomat who traveled all around the world and became very familiar with the different cultures of the world. 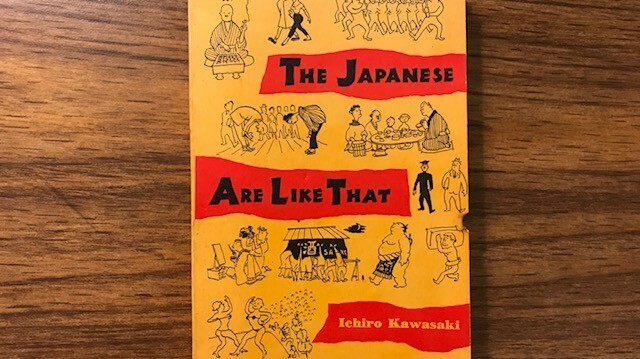 Then he decided to write this book to provide a very candid view of Japanese people and their culture so that they would seem less mysterious to the rest of the world and people could begin to understand why Japanese people are the way they are. Each chapter takes on a topic so that you can learn about and then understand one aspect of the Japanese culture that is very different from the rest of the world, and in particular America. So for example, one chapter talks about why Japanese houses (at the time) were made primarily of wood and paper, and the ramifications that occur of a result of this, such as business men spending a lot of their time after hours at bath houses and tea houses. Where are the women during this time? Well, there’s a chapter on the typical life of a Japanese housewife as well, and let me tell you it is bleak! Or at least it was, and thank goodness that Japan has made major advances in standards of living and individual freedom and such. Anyway, there are thirteen chapters and each one I found to be pretty interesting and very informative. The biggest thing that I noticed however, was this next part. Japanese Life Back Then was Rough! What you have to remember is that during this time period, Japan had just lost World War Two and their entire way of life was changed. One of the most notable is the massive poverty that Japan went through during the 50s. There is even a chapter that talks about how the average Japanese family lived off of $50 per month. I did the math, and it would be about $450 nowadays for a family of four. You also have to take into consideration the population of Japan at the time. It was 88 million and people were really crammed into their cities, houses, and trains. Guess what, now they are at 125 million! That’s a huge increase! In addition to the above things, the normal life was to get out of school, get married and have kids, and then the husband would basically spend his life working and the mother would spend her life raising the kids, keeping the house clean, and preparing the meals. What was really interesting is that Japan was a fairly prosperous nation before WWII, then afterwards they dropped into a bad place economically, and as you probably know they climbed up to become the second richest country in the world for a while, before China overtook them a few years ago. A Culture Lesson or a History Lesson? So what I love about this book is that it is primarily a culture book that helps us outside of Japan learn about life there and the people who are Japanese. But since the information is dated, it is now more of a history book than anything else! This is great because it allows us to take a peek into yesteryear and see where Japan has come from. Of course there are still a lot of people alive today that lived through that period of time, so if you ever get the opportunity to talk to one of them, you will be able to connect with them in that way. Another thing to keep in mind is that a lot of adults nowadays were raised by their parents who went through that rough time, and of course the parent’s experiences and mindsets can have a heavy influence in their children’s minds and lives. So this book is really a history book, told through the lens of a culture book set in 1955. I highly recommend it since you can see the world through a native’s eyes as he lived through it, rather than read a history book that is written from someone in today’s world looking back. It is for sure an entertaining and educational read that will probably take you a couple days or a week to go through depending on much you enjoy reading about this topic. I think that it’s important for us to not only learn the Japanese language, but to also learn the culture and history in order to gain a deeper understanding behind the people and the conversations that they have every day. I’ve read a few books on various things before, but to be honest, there are so many! Not only can you read books that broadly cover an aspect of Japan, but you can also get a book that dives deeply into a single topic. What about you? Have you read any good books on Japanese history or culture? Are there any that you would recommend? Let me know about it by leaving the title and author’s name in a comment below! Thanks! Hello there. I really enjoyed reading your post. I personally plan to start learning Japanese in December and at the moment I trying to find good resources to make sure I can get the most of my learning experience. That on side, I liked your The Japanese Are like that review. As you said, the main problem with the very patriarchal environments are the women and houswife. Through our history we man were not so kind towards our spouses and wives. It is a great thing that the world is now a better place for anyone. Yeah, for sure the majority of human history has been with men in the lead roles and women having to put up with it. When you consider how old the human race is, you can really appreciate just how recently we have changed (in most of the word at least) and now see both men and women as equals. We’ve still got a long way to go, but at least we are heading in the right direction. Click here to see the best Japanese courses for beginners!